Tesla motors and Toyota have cemented their investment. Image from Flickr. Thanks to a blockbuster IPO, Tesla Motors has finally secured additional financing and investment from Toyota Motors. The Toyota Motors/Tesla Motors partnership is just one of the many partnerships Tesla motors has developed in a quest for a mass-market, all-electric vehicle. Is this excitement and investment going to be enough to keep Tesla Motors floating? Tesla Motors is a company that was founded in 2003 with the goal of creating all-electric vehicles. There are currently two Tesla Motors electric vehicles on the market — both more than $100,000. The goal of Tesla is to, eventually, bring an all-electric sedan to the market for less than $50,000. The investment that Toyota and Tesla announced a few months ago was contingent on Tesla completing an initial public offering. Now that the TSLA IPO has been completed, Toyota motors will complete its investment. Tesla motors will purchase the now-closed NUMMI plant. Toyota will help advise Tesla on bringing a mass-produced vehicle to the market. The planned Tesla Model S is intended to be an all-electric sedan vehicle. The 300-mile range of the current Tesla roadsters is the target range for the sedan. Tesla aims to sell the Model S for less than $50,000, which is considered the “midrange” price point for most vehicles. Government tax credits combined with fuel cost savings are expected to add up to make this vehicle more affordable for most buyers. 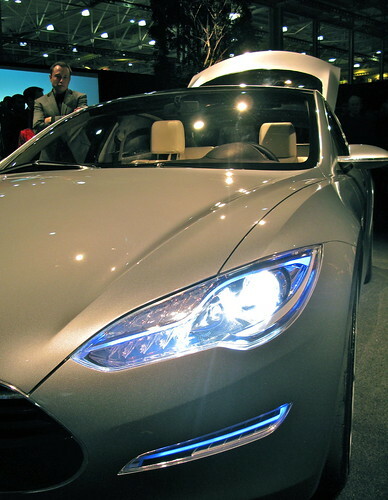 The Model S is supposed to make it to the market by 2012. Tesla Motors has gotten investment from more places than just Toyota Motors. Daimler-Chrysler as well as the U.S. Government have given Tesla Motors loans to help bring the Model S to market. These investments come despite the fact that Tesla Motors has run at an operating loss every year. The hope is that with the IPO investment money, Toyota’s help, the U.S. Government’s help, and the Daimler-Chrysler investment, Tesla may become profitable in the next three years.